The latest rural property report from Knight Frank shows average farmland values across the UK increasing for the second quarter in a row, hitting close to £5,000 an acre in September. And although the market remains ‘patchy’ in places, with some farms failing to sell, land values continue to outperform both property and equities. Having risen by more than 3% in each of the past two quarters, they currently stand only 2.5% below their June 2008 peak, despite commodity prices falling back significantly from last year’s record highs. ‘There’s a feeling that agriculture in the UK has a long-term future, so farmers are keen to buy land. We’re also seeing early signs of the return of the lifestyle buyer as the housing market starts to pick up again,’ says Andrew Shirley of Knight Frank’s rural property think-tank. supportive of agriculture, vendors of farms and estates in the right places can expect a good run for their money this autumn. Following the rapid sale of the £10 million Rushford estate on the Norfolk/Suffolk borders in May, Savills (01473 234810) are banking on a successful outcome to the launch, in today’s Country Life, of the romantic Harkstead Hall (pictured) estate on Suffolk’s picturesque Shotley peninsula. For sale as a whole at a guide price of £9m, the 940-acre mixed farming and sporting estate was once part of the Woolverstone Hall estate created in the 18th century by wealthy Londoner William Berners, and later owned by the Oxford University Chest. The estate was eventually broken up and sold off in 1937, when much of the land was bought by its former tenants. 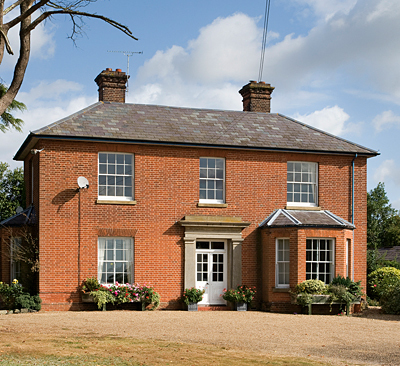 Arthur Ransome, of Swallows and Amazons fame, made Harkstead Hall his home for a short while in 1939 and 1940, during which time he wrote Secret Water, set in nearby Hamford Water, and Big Six, set in the Norfolk Broads. The present owners of Harkstead Hall bought the estate in the 1950s and built it up by judicious land acquisition in the 1960s and 1970s. Set in ‘Constable country’ between the Orwell and Stour, the estate a scenic mix of farmland, woodland and marshland is not only a profitable commercial unit producing a substantial income of more than £220,000 a year, but also boasts one of the finest private family shoots in Suffolk. It comprises a six-bedroom Georgian style farm house, built in 1896, plus a secondary modern farmhouse, four cottages, good stabling and equestrian facilities, and traditional and modern farm buildings, some of which have been converted to business space. And, as selling agent Peter Start points out, ‘not only is Harkstead Hall in a popular farming area, but its proximity to Manningtree station (London Liverpool Street, 55mins) makes it a hotspot for commuters and London buyers’. Relaunched following an abortive sale earlier in the year, the Wilson Group’s high-powered, 1,284-acre Irby estate at Irby upon Humber, on the north-eastern edge of the Lincolnshire Wolds AONB, is for sale through Chesterton Humberts (01522 516830) and Strutt & Parker (020-7629 7282) at a guide price of £7m for the whole, or in three lots. A guide of £5.5m is quoted for 833-acre Dales Farm, the heart of the estate with its impeccably modernised, 6,351sq ft, six-bedroom manor farmhouse, cottage, farmyard, high-yielding arable land, woodland and grass dale, and the setting for a notable shoot. The 450-acre Mount Farm with its farmhouse, two cottages and farmstead, let under an agricultural tenancy, is on offer at £1.5m, and a three-bedroom bungalow in Irby village is for sale at £250,000. With farmers generally in good heart following a successful harvest in the eastern counties, Andrew Pearce of Chesterton Humberts is confident of a positive result this time round. Further west, the recent sale of some arable land on the outskirts of Exeter for well over its original valuation bodes well for the autumn campaign, says James Baker of Strutt & Parker (01392 215631), who is seeking buyers for several substantial working farms. One of the most appealing of these is the ring-fenced, 342-acre Warson Barton near Lydford, 11 miles from Tavistock in scenic west Devon. Once part of the Lewtrenchard estate, the farm was sold off in 1926 by Sabine Baring-Gould, the author of Onward, Christian Soldiers. The main sixbedroom stone farmhouse, built in about 1878, is currently split into two three-bedroom houses that could easily be reinstated as one. There is also a two-bedroom barn conversion, a courtyard of barns with planning consent for conversion to five houses, and extensive modern farm buildings including 40,000sq ft of covered yards. The land at Warson Barton is mainly permanent pasture, withsome 50 acres of woodland providing scope to create a challenging small shoot.